You can build a powerful and flexible motion sensing security camera system using open source software on a Raspberry Pi and similar single board computers. The key is the MotionEyeOS that neatly bundles everything you need into a Raspberry Pi image. Simply burn it to an SD card, attach cameras, boot the Raspberry Pi, and start configuring. It easily supports monitoring multiple cameras, which can be USB webcams, WiFi cameras, the Raspberry Pi camera, or other MotionEyeOS instances. I have an original-version Raspberry Pi (low CPU power) driving two cameras and it handles things just fine. For this project I&apos;m updating an existing MotionEyeOS setup. I&apos;d originally built this system last summer, and decided to update to the latest OS release and at the same time document the setup. Our goal is to see who&apos;s in the driveway in front of the house. There&apos;s a window at the top of the front door, and another window nearby, both of which view parts of the driveway. 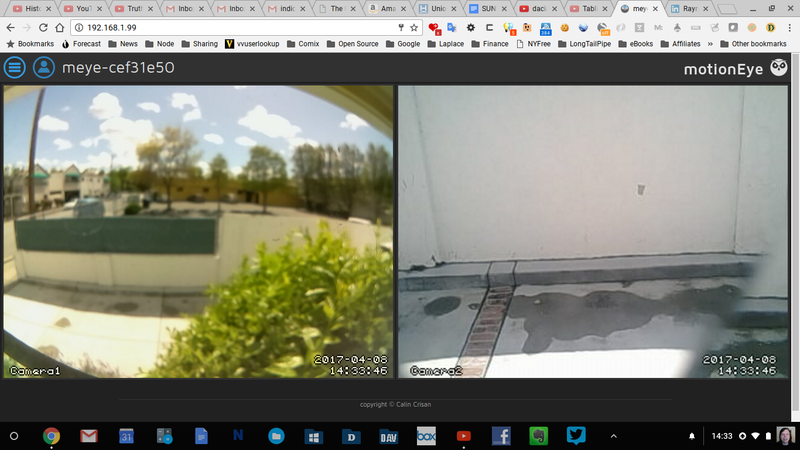 For the front door, I&apos;ve mounted a cheap webcam in the window using velcro tape, then draped a USB extension cord so the door can still open/close naturally with no impediment. For the other window, I&apos;m using a CSI extension cord to reach the CSI camera in that window. There is a bookcase halfway between the two, and the Raspberry Pi is installed on the bookcase top shelf. The extension cords are so the camera&apos;s can be installed in their respective windows. With MotionEyeOS you have a wide choice of available linux single-board-computers (SBC&apos;s), as well as cameras. Each release is compiled for three ODROID configurations and three Raspberry Pi configurations, and they claim support on other boards like the BananaPi and Cubietruck. Even this old/slow Raspberry Pi is able to keep up with the two cameras. If I were to expand this setup, to cover more windows, I&apos;d want to use the Raspberry Pi Zero W. That plus a NoIR CSI camera could be built as a nicely compact camera module at a very low cost. I see in the MotionEyeOS issue queue, plenty of reports of difficulty with the Zero W so that idea is a little premature. Go here: github.com ccrisan motioneyeos releases And download the latest version. The next step is to copy the image to your SD or microSD card. It appears from what&apos;s written on the installation page, that Etcher would work: https://etcher.io/ However, they have some specific instructions on the installation page. The advantage of using their writeimage.sh script is you can pre-load the IP address into the Raspberry Pi. The drive of interest is the last. The device name used, /dev/disk4, is the raw device corresponding to the mounted device. The next argument is the image_file which is what I downloaded off the github releases page. To decode this a bit --- each ethernet segment has a TCP/IP network number. In my case the WiFi router assigns IP addresses in the 192.168.1.NNN range with the network address being 192.168.1.0 and the corresponding netmask being 255.255.255.0. The netmask has a width of 24 bits, hence the address is specified as 192.168.1.99/24 so that the MotionEyeOS software can configure both IP address and netmask. The router itself is at 192.168.1.254 and it also provides DNS service on its own. Therefore it&apos;s not necessary to rely on Google&apos;s DNS (8.8.8.8). That DNS address is important to remember if your government ever goes rogue with Internet access, so keep it in the back of your mind. For our purposes today it&apos;s sufficient to configure the MotionEyeOS to use the DNS provided by the WiFi router. The final argument lists the SSID (network name) of your WiFi network, and the password required to use that network. I&apos;m obviously not going to show you these values for my home network. According to the MotionEyeOS instructions, you just put the SD card into the Raspberry Pi, connect the cameras, turn it on, and after a few minutes all will be good. The "first boot" does initial setup and it&apos;s necessary to let it run without interruption. On my first boot, I waited awhile, then tried to log into the web service, and no go. 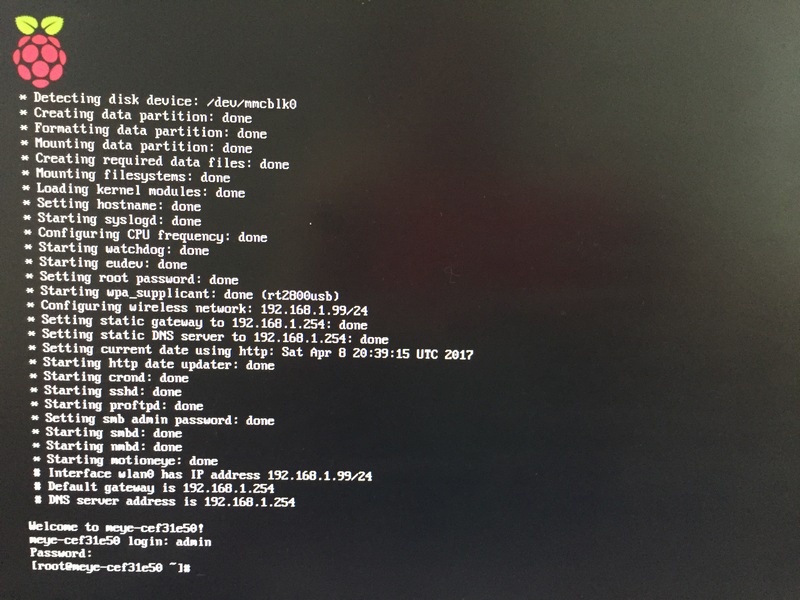 I connected the Raspberry Pi to an HDMI monitor and learned the configuration was failing while looking for a wired ethernet. Instead of booting properly, it was cycling through this failed configuration attempt. LESSON You can connect a monitor and USB keyboard/mouse to the computer to observe the first boot and determine if there are problems. I ran into another problem getting it to recognize the WiFi. This WiFi dongle had already been used by the earlier version of MotionEyeOS I&apos;d used, so it should have worked with no problem. But, during the boot sequence a message was printed about WiFi not working and it would have to reboot. In order to avoid the reboot, I had to connect an ethernet cable from the WiFi router to the ethernet port on the board. Once connected it could boot, and I logged in to inspect the system. LESSON Connecting an ethernet cord can circumvent problems initializing WiFi. And, wait, there&apos;s a -e in the script. I verified that removing the -e and reformatting the SD card results in the computer being able to boot with no problem, and connect to WiFi correctly. The issue is that the Mac OSX version of echo does not support the -e flag, while the Linux echo does. I&apos;ve filed an issue with the project suggesting a fix: github.com ccrisan motioneyeos issues/879 UPDATE: The fix was accepted.